Padiham are doing everything they can to stay among the elite in the Ribblesdale Cricket League. The Ramsbottom Cup winners snapped up maximum points over the double-header weekend in beating Baxenden and Brinscall. And it was a good job as rivals Barnoldswick, also scrapping for safety, won both of their games as well to keep the pressure on. Seven batsmen made double figures in Padiham’s 153-9, with Thomas Ryland top-scoring with 35 at number eight. Rhys Meehan added 25 to the tally, professional Siviwe Gidana made 20 and Jimmy Gray posted 22 runs. Baxenden struggled to make an impact as Padiham’s bowlers got on top. Toby Burrows took 3-28 while Gidana (2-19), Bailey Muldoon (2-30) and Tom Shirtcliffe (2-4) also contributed. 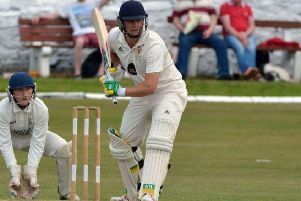 Callum Clarke was the protagonist on Sunday in the 71-run win over Brinscall at the Arbories. The former skipper celebrated his 30th birthday with an unbeaten knock of 106 in his side’s 179-5 finish. 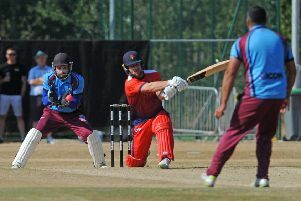 Clarke hit 11 fours and seven sixes in his 71-ball knock while captain Kevin Hitchon (20) and Gidana (22) also chipped in. Burrows then added another six wickets to his collection, at the expense of 44 runs, while Gidana took 3-30 from 7.4 overs. Elsewhere, Read failed to chase Brinscall’s 137-run finish at Whalley Road following a huge batting collapse. Only three players posted double figures, the highest being captain Andrew Rushton’s knock of 19, as they were all out for 64. Sam MacLachlan took 5-19 for the visitors. But three wickets from paid man Matthew Walker helped them see off Euxton 24 hours later. Walker (39 not out) and Oliver Newby (33) then put on 50 for the third wicket to secure a four wicket triumph.